Scratching or running noise in the attic or walls at night. Electrical outages due to chewed wires. Water damage due to chewed PVC water pipes. Bad odors due to rat feces and urine. Horrible odors due to dead rats in attic or walls. Rat sightings scaring poor, unsuspecting women and children. Spread of disease, such as Rickettsia, Meningitis, or Leptospirosis. Rotting wood or growth of mold due to rat waste. Attracting cockroaches that eat poo, or snakes that eat rats. Rats eating your baby in the night (just kidding). Fire hazard due to chewed electrical wires (happens quite often). Alarm system goes off due to rat chewed wires or motion. Food in the pantry chewed and contaminated. And more, but I'm tired of writing. They ought to be removed. You know you have a rat problem in the house when you experience one or more of the above symptoms. I've been called to houses and buildings because of all of the above problems, and each of them has been noticed first by various customers. But I'd say that the most common first clue that there's a rodent problem is the sounds people hear in their attic or walls. Some people don't care about mere sounds, and let the problem go until one of the other, worse things happens, such as an electrical outage. In many, many cases, people don't address their rat or mouse problem (or they do it half-assed, with poison), until they have a dead rodent, and then the stench is so unbearable, that they call me out. At that time, I recommend that the problem get solved for good. Some agree some don't, and the ones who don't usually end up calling me back again to remove another stinky rat! Sheesh. 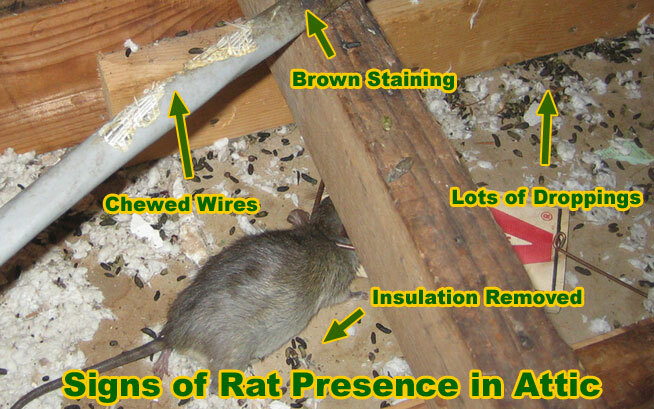 In the above photo we see all kinds of clues about a rat problem in an attic - feces, brown smudges, and even a trapped rat. This is a severe rat infestation case, so you may not notice quite so much activity. Sometimes the evidence can be pretty subtle. Rats often burrow underneath insulation, so even if there is a rodent infestation, you might not notice a whole lot of droppings. Although I wrote this site with rats in mind, such as the Roof Rat and Norway Rat, the same principles apply to other rodents, such as the house mouse. Mice behave very similarly to rats, they're just smaller. Email me if you have any questions about mouse problem, how to solve a mouse problem in a house, problems with mice in the attic, and rodent problem solving. My response: I'm sorry, I have no additional advice that I haven't already written on my website. And I certainly don't ever recommend the use of poison. You'll just have to find a way to seal off the aviary by using a staple gun and quarter inch steel mesh to block off all gaps and openings. It takes work, but it's the only way.